You know they say that looks can be deceiving? The same is true of voices, like you hear that of 94-year-old Louise Gibson, with her deep Alabama twang accent as she speaks about growing up six miles apart from her husband in towns with dueling populations of right around 2,000 people. 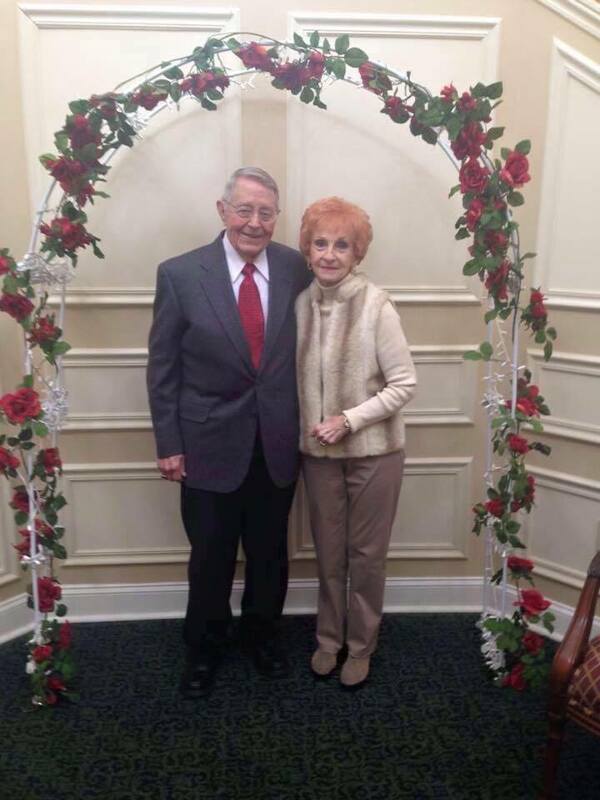 They met while both working for Goodyear Tire and Rubber, and you figured they lived that small-town life for the rest of their days, right through to retirement at Regency Pointe at Rainbow City. But that’s when Louise stops you from getting off the phone to tell you about her Master’s degree. Or about the fact that her husband Robert is a bona-fide war hero. Or about how the couple has not only traveled to all 50 states, but an additional 54 countries. Yes, there’s definitely more to Robert and Louise than meets the ear. 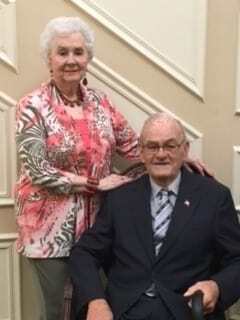 We’ll start with Robert’s involvement in World War II; Louise does most of the storytelling these days for her husband, who has been fighting illness. The US didn’t mind the late sign-up one bit, putting Robert into a B-17 bomber as a waist gunner. He was injured in action twice, the first time so harrowing it could have been a movie as his plane lost an engine over France and the crew had to land her in the River Marne southeast of Paris. On his 24th mission, Robert took flak in his left arm, nearly losing it. Instead he spent eight months in a hospital and underwent several grafting procedures to take skin from his stomach and shoulder. He retired from the service as a disabled veteran, not to mention a war hero. He returned home and got a degree from the University of Alabama; a few years later he was working at the Goodyear factory in Gadsden when he caught Louise’s eye. They got married when they were 30. That was 64 years ago. Louise left Goodyear for three years to become first a housewife and then a mom. Her mother suggested she further her education once the little girl was old enough for daycare, and Louise decided to give it a go. Louise wound up teaching elementary school for 19 years. Robert retired in 1986 and the two took off on a never-ending travel date. The couple already owned a home in Rainbow City when they heard about Regency Pointe. Even though they are into their 90s, Louise still feels more like 65 or 70. Nevertheless, they realized it was time to start a new time in their lives. Music brought Jim and Carma Rayburn together sixty years ago. They’re still making beautiful music together today. Jim grew up in Anniston, a city of 25,000, while Carma called Piedmont, a town of 4,000, home. They met in college at Jackson State University, marrying during their college years in 199. Turns out they were both aiming a bit higher than that. Jim wound up getting a doctorate and working at Livingston state university for three years. They eventually moved to and settled in Fayette, Alabama, where Jim became dean of a community college in the western part of the state. But of course it wasn’t all work for the Rayburns. They had two sons, both of whom went into the medical field. Once medical school was in the books, their two sons delivered what every parent wants as the get a bit older - grandchildren to dote on. It was the couple’s older son, Scott, who got them thinking about Regency Pointe at Rainbow City. Suddenly facing the prospect of being homeless, the couple thought about buying a smaller home in Rainbow City, prompting them to have an estate sale to get rid of the things they could no longer keep. 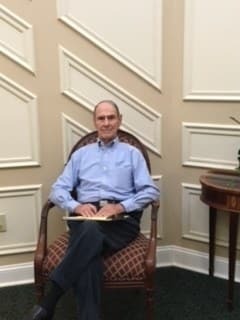 “We had two friends in the area who said take a look at Regency Pointe before you buy something, so we did,” Jim says. On their initial tour, Carma was sold, but was convinced that Jim wouldn’t see it the same way, preferring a private home. “I really thought Jim was going to say no, but he said, ‘Yes, this is where we need to be,’” Carma recalls. The couple now does the things that makes them the most happy. They still drive and go to restaurants when they want a night out, and every other weekend Jim takes art lessons with a professor in Tuscaloosa. Carma is part of a bridge group and takes line dancing, and they to local theater productions on occasion. But you’ll find them most at home every week participating in the church program that features a weekly hymn singing night. That’s Carma, now 80 years old, on the piano, and Jim, 81, on the trumpet, still making sweet music together after all these years. Call it luck; call it fate; call it divine intervention. Whatever you call it, John Willis calls it his life. If not for confusion inside the United States Postal Service in 1918, there wouldn’t have even been a John Willis. His father John Davis Willis, was a native of Atlanta stationed in New York City during World War I. A young lady from Leesburg, Alabama, sent a letter to NYC for a friend of hers stationed there by the name of John Davis. Instead it went to Willis’ father, who wrote the young lady back. They corresponded back concerning the mix-up and soon he was visiting her back home in Alabama. On their fifth date, he proposed marriage and she said yes. So came the younger John Willis into the world in 1924. Fourteen years later, Willis was living with his family in Gadsden, Alabama, when a new teacher came to town to start a high school band where none had ever existed before. Willis went to band camp and found himself to be quite the clarinet player. A useful talent, he had no idea how much his hard work with it would pay off. Considering more than 400,000 of his fellow soldiers did go overseas and never returned, Willis realizes just how special his talent on the clarinet was. After two years at Wofford College, he went to work for Southern Bell. Along the way he, he met his wife and they spent many wonderful years together. Willis found passions for sailing, skiing, and for the ability to do woodworking as he grew older. When he found the knack for creating things with his hands, he began using it for friends and family. He made a loom after seeing one on television, then started with furniture pieces. His most powerful piece would be one of his last. A garden bench that now sits in the yard outside the hospice where his wife passed away. A few months after his wife died, Willis returned home one evening and fell asleep behind the wheel of his car in the garage with the engine running. The buildup of carbon monoxide began to poison him when divine intervention came into play once again. Feeling renewed, Willis began taking better care of himself. With the help of his son he moved into Regency Pointe in Rainbow City.